Even though winter is now upon us with snow on the ground, plans for Pilgrim’s second gardening season are already underway. We’re pleased that over 850 pounds of produce was donated to the Marion County and Hamilton County food banks during the 2018 growing season! As with any new project, we’re learning as we go. 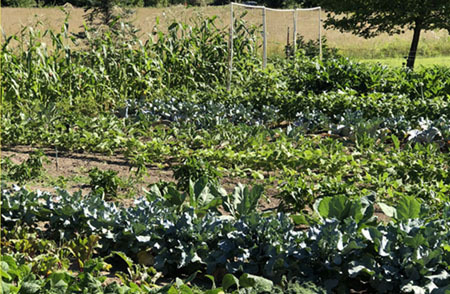 Many of the veggies that we grew last summer were real “hits” with the food banks (e.g. lettuce, peppers, eggplant, broccoli, tomatoes, summer and winter squash, and green beans) whereas some were not as readily received, or over supplied by other donors when in season (e.g. sweet corn). With this in mind, we’ll focus more on the winners, and plan to stagger planting so that we get steadier production over the summer. Also, we’re excited that perennials (rhubarb and asparagus) planted last year will begin to come into limited production in Year 2. We were lucky this past season to have very limited activity from four-legged marauders, but those of you who are gardeners know that this honeymoon only lasts one year. So, plans are underway to place a fence around the garden this coming year. Modular fencing is now available that will keep out rabbits, raccoons, possums, groundhogs and the like, and can be easily moved as garden dimensions change or expand in the future. We’ve identified a product that comes in 3 foot sections, and combined with pavers will encircle the garden while allowing easy access for gardeners and equipment. To this end, we’re looking for some financial help. Those of you who are Thrivent members may be aware of a program that provides funds for designated church projects. Thrivent members may receive up to $250 ($500 for couples) and we’re thinking this proposed project would be a good match. Let me know if this would be of interest to you, and I can provide details on the project scope and cost. We’re looking forward to our 2019 season, but could really use some more workers in the vineyard! Look forward to more communications as to planting, cultivating, weeding and harvesting as spring arrives. We now have a refrigerator more conveniently located in the food pantry to store produce in between food bank runs, and thanks to Evelyn Kramer, a rototiller! Let me know if you have interest. Thanks!